One of the biggest perks of being a CEO of Me is that I get to work from home on my own schedule and set my own rules. While this awesome perk means that I do not have to wear business suits and high heels every day anymore, I have found myself & my clothing becoming more casual and careless than it really should be. This, my CEO of Me friends, is a clear sign of trouble! Yes we work at home, but we do not have to look like we are having a sick day at home every single day. There is still a fabulous, beautiful, stylish person inside that deserves to show on the outside too! As I have been working to live a healthier life, it has become important for me to set a better example & to represent my company, my business and myself well. No, it is definitely not all about appearances. I have just decided that it is time to make my wardrobe match my personality, my goals and the confidence I want to exude and inspire others with too. 1. Look for simple dresses made out of soft, wrinkle free fabrics. Not all dresses are dressy. There are so many cute shirt dresses, cotton maxi dresses & sleeveless wrinkle-free dresses available now. You can make a dress more comfortable and fashionable by adding a khaki or jean jacket with sandals or flats or slip on cardigan and some pumps for a meeting, lunch or dinner date or night out! Long dresses especially are very comfortable when working at home or out and about. I love this summer maxi dress and this long sleeve chevron print dress from Amazon that comes in a variety of colors. Of course I also love my Lularoe Carly Dresses and recently started shipping at an online boutique here in the US called Zig Zag Stripe that has super comfy dresses, shirts, and more. 2. Pair dark blue jeans with a dressy top and cute shoes. Dark wash blue jeans look dressier and make most figures look a little smaller too. Instead of going for a t-shirt & hoodie, purchase a few dressy blouses to wear with those dark jeans. You can easily take your wardrobe up a notch just by pairing a dressier top with nice, dark jeans while still having the comfort of wearing your favorite jeans. My favorite store for finding stylish, quality tops is LOFT (they always have great sales and specials going too). 4. Add a blazer or jacket to dress up or down your outfit before you head out the door. I love adding a jean, khaki or bright colored jacket to a more casual top and jeans or a sleeveless blouse & black dress pants. It just makes me feel more put together and helps my outfit look more like an outfit and can really slim your waist. Even a more casual blazer style jacket can dress up jeans and tshirt. The Zig Zag Stripe also has really great quality and comfy blazers that I love. 5. Accessorize. Add some fun, bright jewelry to all of your outfits. Jewelry always makes the outfit in my opinion. Don’t be afraid of bold, big & chunky jewelry. If you want to keep your outfits more casual or solid colored, kick things up by adding a contrasting piece of jewelry or pair of shoes. Purchase multi-colored jewelry pieces that you can wear with several outfits to save money. Jewelry should not be saved just for fancy events, it enhances your skin tone and eyes as well as your outfit. 6. Don’t forget about comfy but cute shoes. I love sandals and flip flops, Apt 9 brand from Kohl’s are one of my favorites for sandals. For flats I love Jellypop flats! They have a gel cushion insole and are so comfortable to wear. They come in basic more casual styles and dressier ones too. Sketchers also makes a lot of cute, stylish tennis shoes. 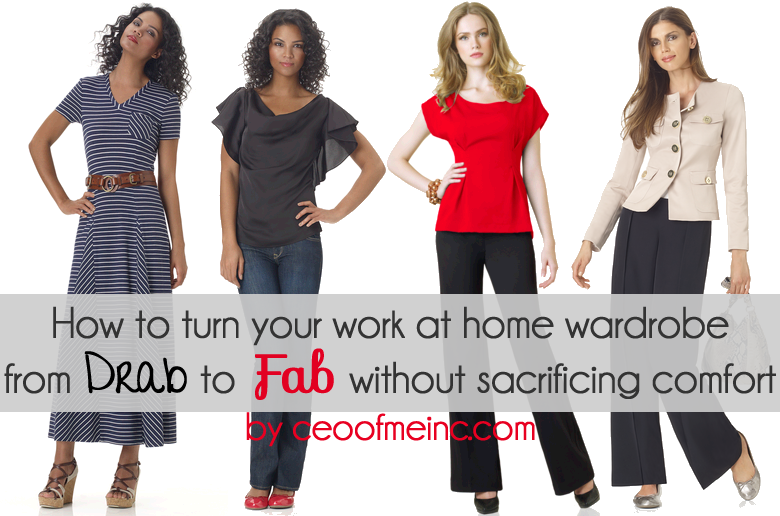 You can still be comfortable but more, shall we say, presentable while working from home. As a CEO of Me, you work hard to live the life of your dreams and your wardrobe should reflect that too! You deserve to look and feel your best! Save the yoga pants for when you are actually working out and show everyone how awesome it is to work from home by how cute & confident you look! If you enjoyed this post, I would love it if you would share it! Also if you have any other fashion tips for other CEO of Me’s or those who telecommute, please share them below! Thank you! I typically work from a hotel room so sometimes I don’t dress up out of my pj’s. 🙂 But I do bring fun clothes with me because I do have to make appearances at the county courthouse to do research and I have to be dressed in at least business casual. Jeans are okay in my field of work so I don’t typically bring office “pants” unless it starts getting into fall. And then for me I really like to dress up because of the layers. There’s so much you can do with adding a blazer and a scarf! I so agree Taylor! I don’t love the cooler weather in fall & winter but I do love being able to pull out my blazers and scarves to accessorize with! The 1st half of this post describes me to a T. I greet the mailman every day in my sweats. This has totally inspired me! I don’t need to wear a 3 piece suit, but I’m sure visitors wouldn’t mind seeing me carry myself a little classier! Thanks Misty. I think part of my issue was that rebellion of now that I work from home you can’t tell me what to wear, lol! I really do feel better and seem to get more accomplished when I dress a little nicer than when I stay in my yoga pants or sweats… Glad I was able to inspire you as well Marissa! As a homemaker and now blogger, I’m always the mom who gets asked if I work outside of the home because of the way I dress. I grew up in a single family household with very little money, but my mom always made sure we looked nice and presentable. My mom would by us the nicest clothing from the Goodwill, yard sales, thrift stores, etc. I think the way you carry yourself really becomes a habit and some habits are really hard to break. Thanks for sharing your great ideas! Working from home is the perfect job virtually for anybody that’s self-motivated and that can follow simple directions. This is awesome!!!! I do not like to dress even when going to my full time job. However, I know that when you change your appearance, it really effects your mindset. These tips will help for work and home. Misty, you are always on time and somehow God’s got us on the same wavelength. I was jotting down notes yesterday while printing pages for my planner, I’ve got to do something about my image. I have become VERY lazy about my appearance (I think that’s one of the reason’s I’ve gained weight). I’ve never been a big shopper, my husband bought the majority of my clothing, however, I was thinking of how to find someone to help my daughter and me with our “images”. VOILA!!!! !, here you come. I love and appreciate the post and most definitely will share improvements made. I’m so happy to help Gail! You are awesome!